Ah, the Star Wars fan base; you will never find a more wretched hive of scum and villainy. Now don’t get confused, the majority of Star Wars fans are lovely people, united by their shared passion for what is undeniably the most popular franchise in movie history. I’m actually referring to the people that seem to whine and moan about things about the series that really don’t call for it; sure, the prequels are almost universally despised among these circles, but when The Force Awakens came out, certain fans were quick to jump down its throat for the most trivial and miniscule of flaws, which revealed a deeper divide between true fans and petty purists. Things got even worse by the time The Last Jedi came around, and the fan divide became so great – for a movie that DARED to take things to a new and unexpected level whilst challenging and even surprising its audience – that suddenly, for many, the thrill of a new Star Wars movie didn’t seem so exciting anymore. This brings us to Solo: A Star Wars Story, a standalone spin-off movie about one of the series’ most beloved characters, and which was so plagued by now-famous production troubles – original directors Phil Lord and Chris Miller were booted off the movie six months into production, with Ron Howard stepping in to complete it – that fan anticipation has been noticeably more muted than any of the other recent Star Wars movies. You’d be hard-pressed to find a Star Wars fan, let alone an audience member in general, who’s legitimately looking forward to this film, which you can certainly pin down to signs of franchise fatigue (it’s only been less than six months since The Last Jedi), but my theory is that fan reaction to the newer films thus far has been so divisive that cynicism has started to seep in and taken the magic out of people’s hopes and expectations for this franchise. It’s kind of a shame, because while Solo certainly isn’t one of the best Star Wars movies (although, were you ever really expecting it to be? ), there are certain charms and a strong sense of fun and adventure that make it far better than most people are prematurely giving it credit for. The film, of course, centres around a younger version of Han Solo (Alden Ehrenreich), who we first meet as a brash and optimistic wannabe pilot that’s stuck on the grimy planet of Corellia, in an Oliver Twist-like situation as he’s working for a slimy worm monster gangster. Eventually, he and his lover Qi’ra (Emilia Clarke) manage to escape, but are separated by fate, leaving Han to make his own way in the galaxy, eventually falling into the hands of career criminal Tobias Beckett (Woody Harrelson) who recruits him – as well as his new hairy Wookiee companion Chewbacca (Joonas Suotamo) – as members of his small team of crooks and thieves. 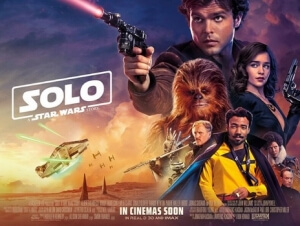 Soon, his path crosses with smuggler and scoundrel Lando Calrissian (Donald Glover), the owner of a certain ship known as the Millennium Falcon, and once more with Qi’ra, who is now working for criminal Dryden Vos (Paul Bettany) who hires Han and his team for a mission. Easily the best thing about the movie is Alden Ehrenreich, who many at first doubted for basically not being Harrison Ford (reports of him being given an acting coach on-set while Lord and Miller were still directing didn’t help to calm people’s nerves), but he really embodies a lot of what so many people love about the character of Han Solo, and brings a familiar yet refreshing sense of swagger and charisma to the part that Ford perfected, with Ehrenreich proving himself to be a worthy successor. His natural charm and strong screen presence make him a protagonist worth following, matched only by Donald Glover’s eerily pitch-perfect take on the role that Billy Dee Williams made famous; one does wish for more of him on-screen in this movie, especially the two of them together, but he’s given enough screen time here to leave an impression. Many of the other actors, including Woody Harrelson and Emilia Clarke, tend to just fade into the background most of the time, but for what they have been given – from a script by Star Wars regular Lawrence Kasdan and son Jonathan Kasdan – they do well enough. For an eleventh-hour replacement, Ron Howard handles directing duties just fine, although he struggles to find a suitable speed for the pace to make audiences feel comfortable; a lot of this movie feels rushed (pacing-wise, certainly not the filmmaking), as certain important plot points like Han and Chewie’s first meeting go by so fast that you barely have time to catch up, and other elements like where and how Han learned to become a pilot are glossed over entirely. By the time the first act of this film reaches its climax, you’re already exhausted by all the information and plot that’s just been thrown at you, leaving very little room for you to catch your breath amidst all this stuff that they are just throwing at you. Things do simmer down a bit as the film gets to its core plot, but it still takes a while for this film to really find its footing when it really should have done so much earlier. While it is a very well-made movie – aesthetically, it’s about on par with the other recent Star Wars movies – the cinematography leaves a lot to be desired, as the darkened and murky backdrops often make it hard to pin-point what exactly is happening in certain action scenes, and it makes certain worlds and environments seem all too bleak, especially for a movie that’s intended to be a much more light-hearted romp than, say, Rogue One. Bradford Young is a talented cinematographer, and there are parts in this movie that he manages to make look absolutely stunning, but when it comes to shooting this film’s action sequences, it’s likely he was given some misguided hints on the lighting to go along with the incessant shaky-cam work. Overall, it does leave you with a good sense of fun, and while it’s far from the top tier of Star Wars movies, it’s an entertaining enough ride to leave you mostly satisfied with the final product. It may have been plagued by certain production troubles, and some will argue against its very reason for being (which, in fairness, there isn’t really one), but the fact that it came out of it as intact as it was is something of a mini-miracle, and certainly not worth the pre-judged cynicism it’s been receiving up to its release. At least give it a chance before you write it off completely; you might just find, like the central performance, it’s a lot more charming than you’d give it credit for. Solo: A Star Wars Story largely overcomes its very public production troubles to deliver a fun and entertaining space adventure with everyone’s favourite smuggler, brought to life in a new way by a very charismatic and extremely game Alden Ehrenreich, and while the film is certainly flawed, from pacing issues to questionable cinematography, it’s far from the absolute disaster some have prematurely been judging it to be.